In-N-Out Burger - Fullerton, CA, 1180 S. Harbor Blvd.. Welcome to our restaurant in Fullerton, CA. 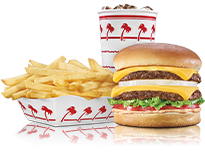 At In-N-Out Burger we use only the freshest ingredients with no heat lamps, freezers or microwaves to deliver on our promise of Quality You Can Taste®. 10:30 a.m. - 1:00 a.m.
Sunday - Thursday 10:30 a.m. - 1:00 a.m.
Friday - Saturday 10:30 a.m. - 1:30 a.m. Copyright © 2019 In-N-Out Burgers. All rights reserved. © 2019 In-N-Out Burger. All rights reserved.